Happy Cards | Happy Cards - Happiness & Kindness Cards! 30 WAYS TO FEEL AMAZING EVERY DAY! Stop feeling so much worry, anxiety and even depression! spread happiness and I want you to join me! Happy cards has given my life a new purpose and mission and I want to share it with you because I think you’re really going to love it! I think it’s going to help you and many people around us. Stress is a killer! It’s a major contributor to high blood pressure, stroke, heart disease and other diseases that often result in early death. And boy oh boy have I endured a lot of stress in my life! I won’t bore you with the details but dealing with diabetes (50% of the nation is pre-diabetic or has diabetes today), arthritis and carpal tunnel pain is stressful! On top of that the stress of the daily grind to make enough money to pay all the bills each month, navigating social media arguments, and watching the world fall apart on the news was just brutal! If you have had to deal with anything like what I have and am going through you know it can lead to anxiety, despair and even depression. You’re not alone! Everyone of us is going through something. I bet when you feel all this negativity going on you just want to turn off the news (great thing to do! ), let go of the negative people around you online and do stuff that makes you happy, right? Well after studying the thirty years of research in the field of Positive Psychology looking for the key to happiness, the answer kept coming back to two things. Those two things are focusing on gratitude and being part of something bigger than ourselves! So I started looking for ways to thank people every day. I talked to people I stood in lines with, people who called me to sell me stuff, and found ways to sincerely thank them. It shifted my entire feeling and momentum in life in a very positive direction! Even the chronic physical pain I was experiencing faded into the background of my life. The answer is to put our phones down, and lift other people’s spirits up! 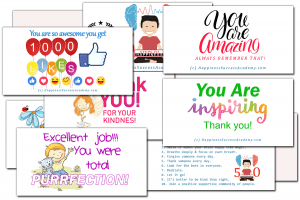 I created these colorful thank you cards I call Happy Cards as a tool to help you stop and smile, and talk with people around you and say something kind to them. When you do this your life and many lives around you will change in amazing positive ways! This is about creating purposeful moments of human decency and kindness and it’s very exciting and powerful. I really want you to be a part of this experience with us! Happy Cards will help you now. It turns out in life, now, the present is the only time we have. People call being present in life “mindfulness” and have found it hugely beneficial to their mental, emotional, physical and financial health. Happy Cards helps you take mindfulness a step further to experience Mindful Happiness! A social media pal told me today that kindness doesn’t cost anything. I said not only is that true kindness doesn’t cost anything, but in fact kindness is very rewarding! GET YOUR HAPPY CARDS TODAY! THIS REALLY WORKS! WATCH AND YOU’LL UNDERSTAND WHY. 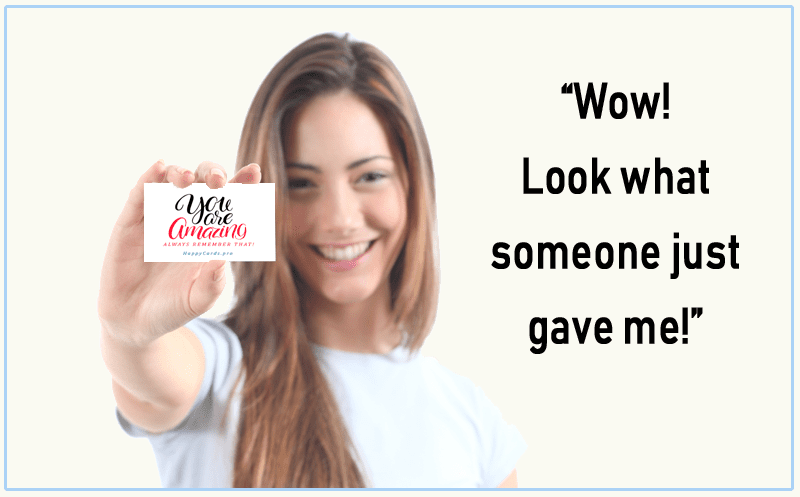 POWER OF APPRECIATION CAN DO FOR YOU! Give one Happy Card to someone every day for the next 30 days and watch your stress and anxiety decrease! Give one Happy Card to someone every day for the next 30 days and watch your stress and anxiety decrease! This is a powerful tool and exercise designed to create a habit of happiness and greater inner peace. Another common reaction we have received from card recipients is “this is just what the world needs today!” Imagine that! You are just what this world needs. All it takes is reaching beyond your phone and your bubble of comfort and engaging in some tiny hugely powerful acts of kindness. Click here to see examples of how you can use these! That co-worker sitting nearby who is always looking at the picture of their kids on their desk and up at the clock thinking about getting home to them and struggling through another day. Your husband or wife or significant other who sometimes we take for granted but really makes our life worth living. A teacher at school who took the time to help you get through a rough patch at school or dealing with other students. The person delivering your water or mail who is always so rushed to keep their schedule and working so hard to make it through another day of work. The person standing in line with you at the pharmacy or bank who might be dealing with struggles none of us can see. A friend you really appreciate who helps you laugh and smile more often. A parent who loves you to the moon and back, whose love you know is always there for you. A neighbor walking their dog around your block who nobody waves to or talks to because everyone’s always so busy. Another student who helps you with your studies or who is dealing with the stresses of exams and school. That hard working young man or woman who served your food at the restaurant after standing on their feet for 8 hours dealing with hungry, rushed customers and still had time to smile and ask you how you were. Get an example of the power of these affirmations by watching these affirmations below and repeating them out loud daily. This will help install self-loving core life principals into your subconscious mind that will help you support your health and happiness. Watch the affirmation below it will change and reveal new affirmations after a few seconds. Try it now! Get the book! Read more about how and why these affirmations can help you download this free book and get these affirmations sent to you today!